Who Will Care When You’re Not There? Planning for death and disability isn’t the most appealing activity most of us face. While we may eventually get around to making a will, we often overlook the family our states won’t recognize. Our treasured pets will only be treated as property if we don’t take action to protect them. 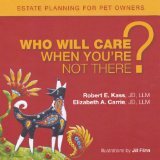 But estate planning for pet owners doesn’t have to be difficult, with this legal guide. It covers important matters like: who should care for your pets? how much will it cost to care for them and where will these funds come from? will the caretaker have full responsibility for end-of-life decisions, when your pet becomes terminally ill? and who will manage the funds you’ve made available for your caretaker? Pet owner information sheets, forms, and other checklists are provided for your planning needs. Well-meaning friends and family may offer to care for your pet someday, but don’t leave this important decision to chance. Set up a pet trust, determine your care-giver in writing, and you can feel better knowing your treasured companion will be cared for and protected. Who Will Care When You’re Not There? provides the assistance, so you can have peace of mind, knowing that someone WILL care.